To remove the skin from the tomatoes, if using fresh tomatoes, score a X on the bottom of each one and blanch them in boiling water for a minute. Remove them from the boiling water and transfer them to a bowl of cold water. When cold enough to handle, starting where you scored them, gently remove the skin. Chop the tomatoes and put them in a large pot with 1/3 cup of the oil or fat with the parsley, basil and garlic. Cover the pot partially and simmer while stirring from time to time for about 30 minutes, until the tomatoes are well broken down. While the tomatoes are simmering, sprinkle some sea salt on the eggplant cubes and put them in a colander in the kitchen sink. This step helps remove some of the moisture in the eggplants. Leave them in the colander while the tomatoes are simmering. Soften the onions in 3 tbsp of the oil or fat for about 10 minutes with some sea salt still while the tomatoes are simmering. 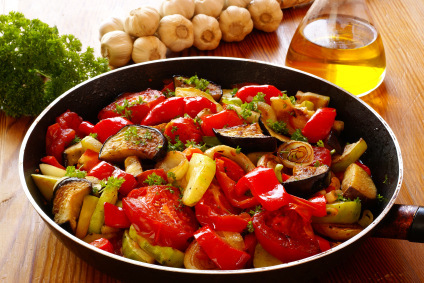 Remove the onions with a slotted spoon, set aside and cook the bell peppers in the same manner with a little more oil or fat. Remove the bell peppers with a slotted spoon, put them with the onions and repeat the process with the zucchini, but only for 6 minutes this time. Remove bell peppers and set aside with the other vegetables. Pat the eggplants dry and repeat the process, cooking them for about 7 minutes, again adding some oil or fat each time. Once the tomato preparation has simmered on its own long enough, add the previously cooked vegetables, season generously with sea salt and black pepper, cover and simmer for about another hour, until all the vegetables are very soft. Serve hot, warm or cold, with a bit of extra basil or chopped parsley on top, if desired.